Computing in High Energy Physics (CHEP) provides an international forum to exchange information on computing experience and needs for physicists and computing professionals from the High Energy and Nuclear Physics community, Computer Science, and Information Technology, and to review recent, ongoing and future activities. CHEP 2013 is organised by Nikhef, the Dutch national institute for sub-atomic physics, in collaboration with partners. You can register for the conference and arrange your preferred lodgings on-line. The conference registration gives access to all plenary and parallel sessions, lunches from Monday to Thursday, coffee and tea breaks, and the Thursday dinner cruise. Register early and save 145 Euro over the on-site rate! Booking early also gives you the best choice in lodging at the special conference rates. We would like to invite you to the congress dinner on 17 October. The dinner will take place on board of the Ocean Diva, a large and impressive boat that will take you for a trip over the Amsterdam waters while enjoying your dinner. Please join us for this exceptional dinner! One ticket is included in the registration fee. A limited number of tickets for accompanying persons to the social event is available through the registration web site for € 130. Cancellations after October 4 will not be accepted. For hotel bookings made through the registration web site, additional terms and conditions apply. 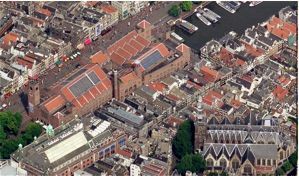 The conference will be held in the centre of Amsterdam in the historic heart of this UNESCO World Heritage city, surrounded by the famous canals. We have selected a range of hotels for you with special rates for the conference (from 13-18 October), which you can book during the registration process. The cheapest rooms start at 88 Euros per night. To get a preview of the hotels, and see the booking terms and conditions, download the hotel PDF leaflet. We are pleased to confirm most of the exiting plenary programme already, with talks by Brian Bockelmann, Philippe Canal, Pirjo-Leena Forsström, Jim Kowalkowski, Robert Lupton, Inder Monga, Axel Naumann, Harvey Newman, Stefano Spataro, Edwin Valentijn, Torre Wenaus, and a panel lead by Oxana Smirnova. Look at the list of speakers and parallel programme tracks. Abstracts must be submitted on or before Monday 25th March 2013 at 2300 UTC via Indico. We expect to be able to send notification of acceptance or rejection by the 24th of May. Authors of accepted and presented contributions will be requested to submit a full paper by the end of the conference (submission dead-line: 21st of October 2013). CHEP 2013 is organised by Nikhef, the Dutch national institute for sub-atomic physics, in collaboration with partners. Details can be found at the conference website www.chep2013.org, or you can follow us on twitter. For more information please contact CHEP2013, Nikhef, P.O. Box 41882, NL 1009 DB Amsterdam, The Netherlands. Or by e-mail at info at chep2013.org. Register at http://www.chep2013.org/registration to receive future bulletins and invitations.